Like the 70’s pop song “Anticipation,” the prospect of knocking out home run number 500 is music to the ears of Detroit Tigers outfielder Gary Sheffield. After finished the 2008 MLB season with the tantalizing total of 499 career homers, The “Iron Shef” is looking forward to become the 25th member of The 500 Home Run Club® in the early days of the 2009 baseball season. Unlike All-Stars Lou Gehrig (493) and Fred McGriff (493), who retired just shy of hitting 500 dingers, Sheffield is looking forward to playing another year and to enjoying the honor of becoming the 25th member of the most elite club in major league baseball. The enormity of being the first Tiger ever to hit 500 home runs isn’t lost on Gary. "I didn't think it would sink in, but it is," he said recently. "It's something that I never envisioned would happen. Just to play this game and play it for 20 years, I thought that was special, but to get to this point, I feel something big is happening." Although Manny Ramirez is known for getting on hot streaks during which he literally carries his team on his shoulders (as he did during the 2008 Dodgers playoff run), he was slow reaching the 500th milestone. After hitting No. 496 on April 19, 2008, it took him 34 games to finally get to 499 on May 28th. By the time he finally slammed the magical #500 on June 1st, the tension was getting palatable. Although he said hitting #500 was “worth the wait” there’s no doubt he was relieved to have the landmark homer in his rearview mirror. "Not everybody has the chance to get to 500. I'm proud to do it...but I was happy to move on." 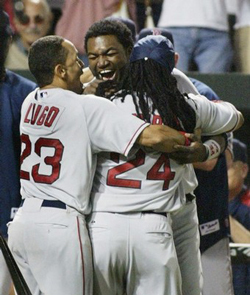 Manny’s relief was evident as he rounded the bases, first high-fiving Boston’s first base coach Luis Alicea, then slapped hands with third base coach DeMarlo Hale, then embracing on-deck hitter Mike Lowell as he crossed the plate. The hug-fest continued as he was mobbed by his Red Sox teammates outside the dugout, and bounced up and down by teammates David Ortiz and Julio Lugo. "It was great, especially since I've been trying so hard the past three weeks just to get it done," he said after the game. "It finally came and I'm happy. I'm proud of myself, of all the things I've accomplished. Now I can go and have fun." Every ballplayer would agree that landmark individual achievements mean even more when they come in a game-winning effort. Such was the case for Jim Thome, who joined the club with a walk-off game winner on September 16, 2007, a day when the White Sox handed out Jim Thome bobbleheads as a promotion. After going homerless during the White Sox home stand since hitting number 499 on September 12th, the Chicago DH was 0-for-4 when he came to bat with the game knotted at 7 in the bottom of the ninth. In a scene that couldn’t have been scripted any better by a Hollywood screenwriter, “The Thomenator” showed great patience at the plate before launching a 3-2 pitch off Dustin Moseley deep into U.S. Cellular field’s left field bleachers for his 500th career homer, capping Chicago's rally from a 7-1 deficit. "Just can't believe it, I really can't," said an emotional Thome, after his teammates pushed him out for three curtain calls from the 29,010 in attendance. “I would never have imagined doing that as a walk-off. It's just amazing to see your teammates standing there. It's like a movie script. It really is." Although he hit many memorable home runs during his 15 years as a Chicago White Sox, “Big Frank” Thomas’ most remarkable home run achievement came as a member of the Toronto Blue Jays. Batting in his familiar DH role, Thomas drilled a 1-2 pitch from Twins starting pitcher Carlos Silva an estimated 396 feet over the left-centerfield fence for a three-run shot and a 4-0 Toronto lead in the first inning. Thomas’ hot day at the plate continued as he added an RBI double in the third inning. The thrill of becoming only the 21st player to join the exclusive MLB club - and first in Blue Jays history - was cut short, however, when he was ejected in the final frame by home plate umpire Mark Wegner for arguing a strike three call. "I'm probably the first to get 500 home runs and get thrown out of the ball game," Thomas said. "That's something I didn't want to happen, but the moment just got the best of me. Ken Griffey Jr. went exactly one week between home runs 499 and 500, but his landmark blast couldn't have come on a better day. 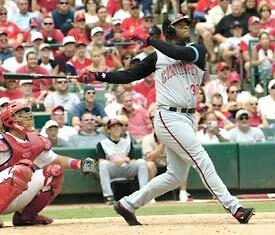 Hitting the homer on Father's Day 2004 was the perfect way for Junior to end his quest, considering that he and his dad, Ken Griffey Sr., are probably the most famous father/son duo in Major League history. Following the 393-foot solo blast off Cardinals right-hander Matt Morris, Junior first was mobbed by teammates. But he didn't waste any time making his way to his dad, who was sitting right next to the Reds dugout. "I told him I loved him," Griffey said. "That's it." "The last thing my mother said before I left today was that I was going to do it today," Junior said. "She said, 'You always hit home runs on your dad's birthday and things like that, so today you're going to hit a home run. '” Turns out Mrs. Griffey’s hunch had a lot to do with history. The homer was Junior’s fourth career home run on Father's Day. He's also hit eight homers on his father's birthday. The Father’s Day gift seemed all the more appropriate because it was Junior's closeness to his father that spurred the nine-homers-in-14-games tear that put 500 within reach. A little more than a month before, Senior had been watching his son play on TV from his Florida home when he noticed Junior's hands were slow through the hitting zone. Senior called his brother Louis, who happened to be at Great American Ball Park, and told him to relay the information to Junior. 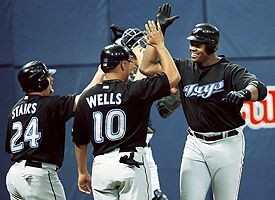 Louis did, and Junior responded with a double and a home run, igniting the run that put Junior back in the public eye. "It's really not tinkering," Griffey said of his father's occasional advice. "It's just him saying, 'You're doing this wrong.' Sometimes, it's just alignment. I'm too closed. Instead of striding toward the pitcher, I'm striding toward the shortstop." Any way you look at it, when it comes to the Griffeys, Father Knows Best. On August 4th 2007, Alex Rodriguez’s became the youngest player to hit 500 career home runs…a feat that came with equal parts relief and celebration. After waited eight days and 28 at-bats to hit his 500th long ball, A-Rod admitted that he tried to will himself to just slug one more. “I wanted to do it at home,” Rodriguez said. “I knew it would come at some point this year, but with two days remaining before we went on the road, I wanted to make sure we did it at home."